The very early game of King's Bounty is pretty rough. Really, the biggest challenge of the game is probably beating the three "Guardians of Light" that appear right after you first meet the spirit of darkness. You are level 5, have access to only a small selection of troops, haven't been able to search for artifacts or spells, and don't yet have rage abilities. These are very poor conditions to take on an army much larger than your own. One thing that helps a lot is that you start the game with two vampires. 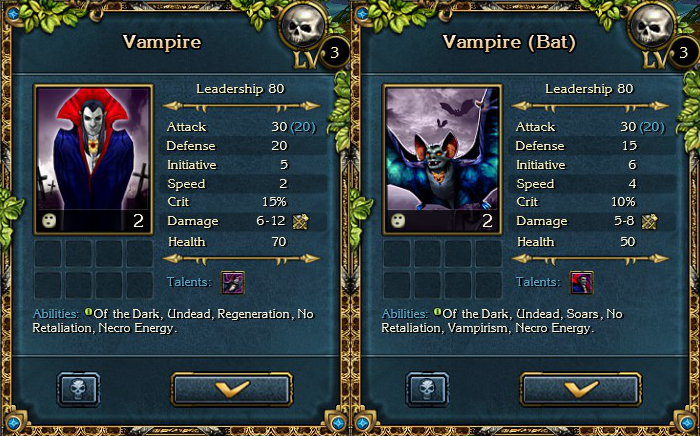 When you start a battle, Vampires are in Vampire form, but they have the ability to change into bat mode. That doesn't take their action and they can continue their turn after transforming. Transforming clears negative status conditions and heals the vampires to full. So you can choose between two speed and better combat stats or four speed and worse combat stats. But there is a lot of other text there. On the left side there is Regeneration, which heals the vampire to full at the beginning of each of its turns. That doesn't matter much in the late game when it is healing a few percent of their total health, but in the early game it lets vampires take on substantially more than they ought to be able to. On the right side there is Vampirism, which returns health to the vampire based on how much damage they do and can resurrect dead vampires. But the most important text on each side is "No Retaliation." When a vampire attacks, the victim doesn't get to strike back. Because of that, and the speed of the bats, the two vampires you start with can beat out large numbers of slow moving units, which is awfully handy to get through at least the dwarf fight. I haven't made much use of vampires, or even the improved version, Ancient Vampires, after those initial fights yet, but I always keep them in mind should a fight arise that requires some kind of extreme kiting. A couple of notes about this fight: My leadership is just under 400 - Skeleton Archers are 13 each, Imps are 40. The enemy stacks average 890 leadership, so if this were zombie on zombie it would be my 13 against their 29, and that's with unfortunate rounding for them. The dwarves move two, but have a one charge ability that lets them move an extra two, which is why they cross as much of the field as they do on the first round. The foreman - the dark bearded fellow - has an ability that makes the slowest dwarf unit on the field gain two speed and initiative for two turns. It gets the dwarf who runs down the right side. Because of that foreman ability I consider him to be the greatest threat, but at the same time he has very high initiative and uses the ability before I can stop him, so I work on the fast dwarves first before turning my attention to him to make sure he doesn't get a second activation. I don't manage to get the vampires in place fast enough to distract the second set of dwarves so I have to melee them a bit but it works out fine thanks to the no retaliation ability on imps. By round five the fight is essentially won - all the enemies are either not dead before their next turn or completely controlled. Between rounds 7 and 9 I do a very clumsy job of turning around, missing two attacks. On round twelve I finally drop the vampires out of bat form, confident that the miners can't do the required 70 damage in a single turn to beat them. I could have done that sooner, but was playing fast instead of doing math. The furious goblins were basically brought in to soak damage, so losing just them was a result I was perfectly content with. The dwarf fight is the easy one, but on my last attempt to run impossible I'd lost my entire army aside from the vampires to it. I'll explain why next time.